Of course, there is the CDK manager in Bioclipse (Fig. 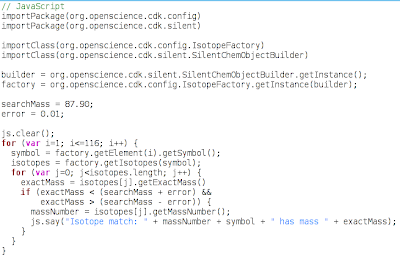 2, doi:10.1186/1471-2105-10-397), which exposes a good deal of the commonly used functionality, but yesterday there was this question on the CHMINF-L mailing list about how to find all existing isotopes, given a certain exact mass. It's an image as I had to make one for MyExperiment.org where the source code can be downloaded. One of the advantages of a print journal is that you are effectively forced to look at papers which may not have received your attention in the first place. Online journals do not provide such functionality, and you're stuck with the table of contents, and never see that cool figure from that paper with the boring title. Of course, the problem is artificial. We have pdftk and we can make PDF of issues, or in the present example, of complete volumes. Handy, I'd say. It saves you from many, many downloads and forces you to scan through all pages. Anyway, I wanted to scan the full JChemInf volumes, and rather have one PDF per volume. So, I created them. And you can get them too. The journal is Open Access after all (CC-BY). results in Firefox with the Web Console. SPARQL and RDF are very quickly becoming the (Open) standard for linking and accessing database works. Readers of my blog I have been searching the corners of what can and cannot be achieved with this for some time now. 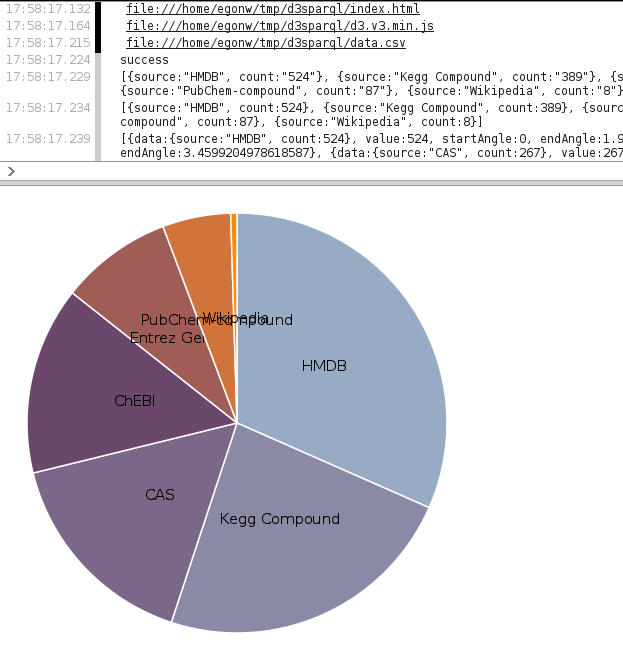 Triggered by some nice visualization work at the BioHackathon on ChEMBL content, I picked up visualization of RDF data (see this 2010 post where I asked people to visualize data using SPARQL). So, and since d3.js is cool nowadays (it was processing.js in the past), so I had a go at the learning curve. 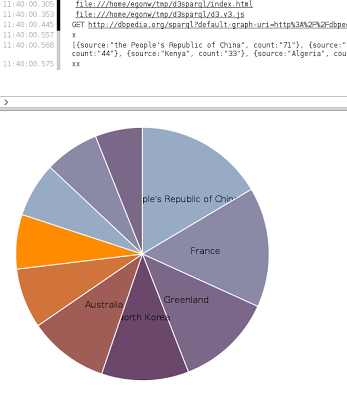 I started with a pie chart and this example code. Because I was working on the SPARQL queries for metabolites in WikiPathways (using Andra's important WP-RDF work, doi:10.1038/npre.2011.6300.1). Because SPARQL end points can spit results in many formats, there are many ways to hook it up. CSV (MIME type: text/csv) seems to be the simplest, and because my SPARQL query has all the semantics already, I am happy with simple column headers like source and count. "translate(" + width / 2 + "," + height / 2 + ")"
I cannot say I understand 100% of this code yet, but here goes: the first half defines some parameters, like how large the pie chart is, which colors to use, etc. The red bits are the column names in the CSV output. One of the more puzzling things was the code that calculated the total count, but I changed the "count" variable name to "total" (colored blue) to make it more clear to me. The d3.csv() method loads the data from a CSV file or stream. The stream is asked for by replacing the file name (viz data.csv) with the full URL with the SPARQL query, such as this one for the running example. This URL has this bit "&format=text/csv" which ensures the SPARQL end point returns the data in CSV format. Now, changing this to "&format=text/html" returns a HTML version of the results. The results are shown at the top right of this blog post. But that problem aside, which will resolve itself when upgrading the Virtuoso installation I expect, mission accomplished.